The supposedly peace loving liberals among us must feel blind sided as regards the middle east these days, as they are a great many things. Because of Bill Clinton’s bumbling in the middle east, we’re now closer to war than we have been in years. Ah, yes… middle east peace. Never have so many westerners given so much for so little. So great is the need to believe that sacrifice and bloodshed will not be necessary; and that peace and prosperity are the universal goals of mankind, that they were willing to accept the help of a known liar toward their goal of, as Nevile Chamberlin put it; “Never to go to war with one another again”. Thing is, facts refute liberalism. The middle east is no different than any other armed conflict in the history of man. Others learned the lessons, painful as they tended to be. Chaimberlin’s England, for example, along with the remainder of the free world, learned about appeasement of a mortal enemy the hard way. The American left, apparently not having leaned the lesson taught by the infamous socialist, Hitler, was taught the lesson again, by another band of socialists, as Soviet tanks rolled into Afghanistan. It is clear reading Jimmy Carter’s comments on the era, that HE hasn’t learned anything from the experience, to this day. I doubt the remainder of the American left have leaned their lesson yet, either As evidence, I point to the recent events in the middle east, and their foolish forbearance of Clinton’s vain and blind pursuit of his legacy… right in the same spot Jimmy Carter tried so hard to earn a legacy that, alas, lasted around, oh, fifteen minutes. Al at the expense of Israel. Israelis seem to be waking up from the over-long self delusion… one that’s been going on since President Clinton decided he wanted to try and create a legacy for himself, other than Monica, and a string of dead bodies and other scandals. One wonders if leftist Americans will EVER wake up. From Oslo to Camp David, Clinton has pushed Israel to the bargaining table, and pressured her to give up vital strategic and cultural assets she has no business giving away, if survival is at all on her agenda. 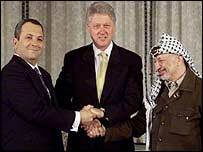 Ehud Barak, by his giving into Bill Clinton (who, along with his staff including Jim Carville, did much to put Barak into office), has done little more than demonstrate just how empty the Palestinians’ peace talk really is, and how desperate Clinton was to be seen as a good President, his crimes against his oaths not withstanding. At Clinton’s insistence, Barak offered Arafat the keys to the kingdom; just about all of the West Bank and Gaza, plus East Jerusalem and even Palestinian sovereignty over the Temple Mount. How do the peace loving Palestinians respond? Yasser Arafat turned it all down, and gave us another few nights of headlines, filled with kids in the street throwing stones, and being shot, occasionally. He also sent his armed forces, (You recall, they’re supposed to be policemen?) to fire at the Israelis, apparently hoping for an excuse to tell the rest of the world how Israel is a war-mongering nation. Of course that should have been a signal to about anyone with a brain that he didn’t give a damn about peace. All he and his followers are interested in is the destruction of Israel. It should have also been a signal that Clinton’s attempt at a legacy backfired, big time, and more, that it didn’t have a chance to start with…. something that Clinton should have known, did he have any understanding of the situation at all. You will recall, perhaps that back in 1992, Clinton more or less bragged he had no understanding of matters of foreign policy. This was never quite so clear as during this monstrosity Mr. Clinton unleashed on the world. For Israel’s part, all of this has been laid at the feet of Ehud Barak, perhaps unfairly. No, I don’t think he was the man for the job, and clearly was only in the PM’s position because Clinton’s people worked so hard to get him there, apparently hoping to set up Clinton’s brokering a of peace deal. Easy to do when you have the PM of Israel owing you his election. But Barak apparently was under pressures he had no control of, having nothing to do with politics at home, or the Palestinians… both of which were quite out of his control to begin with, in any event.. He was concerned with Israel continuing to get support from the US. In this concern, he saw Israel as being on the controlled end of the puppet’s string… and knowing that if he did not capitulate to Clinton’s demands, that vital US support would wither as quickly as Benjamin Netenyau’s prime ministership did, when it became clear he wasn’t going to buckle to Clinton’s concession demands. And Barak wasn’t alone, nor was the left in Israel, in this perception of US control versus Israel’s survival. Yitzhak Rabin, hardly a liberal even by American standards and certainly not under Bill Clinton’s extortion based control to the extent that Barak was, saw the same problems. His longtime friends, according reports I’ve seen, tell us he was deeply troubled over the prospect of losing US support… and therefore bought into the ‘land for peace’ deals being brokered by the liberals in the US. This was something I predicted he wouldn’t have done. Israeli voters, seeing this happening, and clearly annoyed with the US control over Israel’s dealings with the Palestinians, trounced Barak in the polls. Unless one considers this anger, the election of Ariel Sharon, his replacement, is hard to fathom, since he has never been overly popular, as best I can tell. But perhaps the people of Israel are finally figuring out what the real story is.. that in truth, there is no dealing with the Palestinians, and Arifat. One hopes that they’ve not been too late in coming to this conclusion. If they are, world war seems fairly certain to me… possibly nuclear in nature. However… also of great import, I think, and far more certain, is the damage that has been done to our ability to deal with other countries on the world stage, even on the assumption that Israel survives all they’ve given away under Clinton’s threats. Our foreign policy influence has been diminished, because other countries, seeing what has gone on with Israel, one of our best friends, will trust us less, when we come with the helping hand. They’ll be, perhaps, wondering what the OTHER hand is doing. And after Bill Clinton, who could blame them? And no… as much as I loathe Mr. Clinton and everything he stands for, I’m not piling on. I am simply issuing a warning that the damage he has caused will take a while to heal, if it will ever do so. And that we should avoid making such choices in the next several elections. Never again should we as a nation or as a world, allow ourselves to be pushed into the situation we found ourselves in with Mr. Clinton’s attempts at salvaging face. Our future, assuming we actually have one, will depend on it.